I made this recipe up the other night when I wanted a quick and easy dinner. Quick and easy dinner we got. It took less than about 20 minutes to prep and get on the table. Then again, i did use a prepared box of organic spinach couscous instead of making my own. Shame on me. But, I doubt prepping your own would've added any substantial time. Couscous cooks in mere minutes. This dish wasn't amazing, but it also wasn't terrible. I've found that I've made similar dishes with more flavor, so I'll probably mess with some of the ingredients if I choose to make it again. But, it is healthy! So, quick, easy, healthy and edible = score! The weather in the Twin Cities has been gorgeous. No clouds, bright sun, blue skies, breezy and in the 80's. I've been spoiled so far with some time to ride my bike and explore routes I'd never traveled. 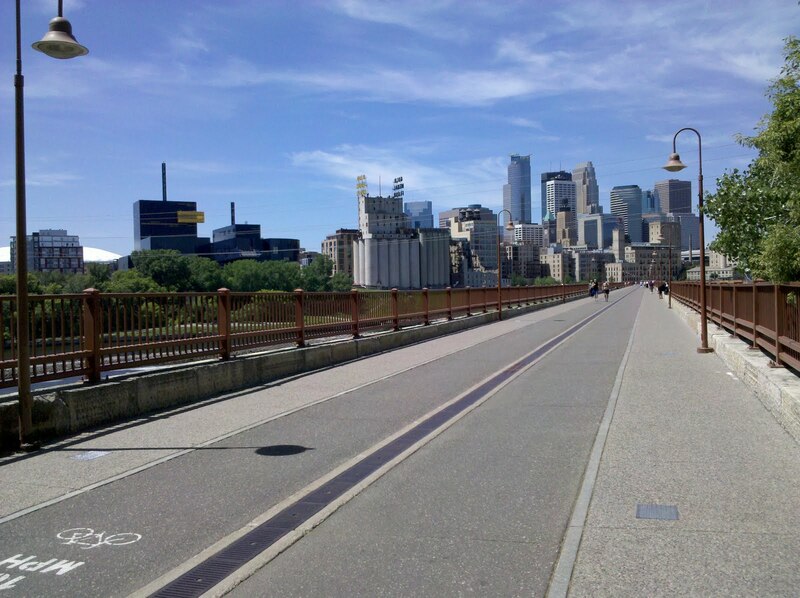 Yesterday, I went on a longer bike ride through both St. Paul and Minneapolis. I parked my car at school and made my way through so many awesome places I had never seen before. The route took me through Como (around the lake, past the zoo and conservatory and by ComoTown), through the MN State Fairgrounds, through the U's St. Paul campus, then, via the intercampus transitway, through the U's MPLS campus. I passed through Dinkytown and made my way to the Stone Arch Bridge where I saw a beautiful view of the city skyline. Then I continued on the path by the river until I turned into the city and drove down 1st Avenue North during the lunch hours. So many people were out eating lunch and getting excited for the evening's Twins game. I was ever so impressed with the bike lanes inside the city. No one gets in your way! (Not so impressive was the fact that I hit every single red light on that 1-mile long stretch.) I eventually turned on 11th (yep, I got stuck at 11 red lights) and merged onto the Cedar Lake Trail which passes the new Twins stadium. I was impressed with both. The stadium is great (though it can't beat PNC Park) and the trail was so secluded and calm. The running trail was recently voted best place to run by City Pages. Yep, still going... I made my way to Lake of the Isles. Oh my goodness! What do people do for a living over there? The houses were beautiful and right inside the city limits. It reminded me of Lake Minnetonka, but you could still see the city skyline! 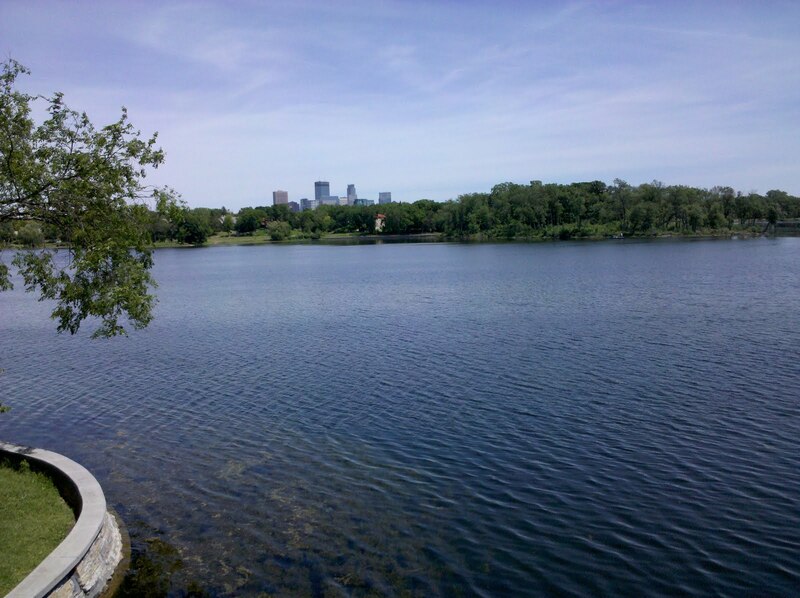 Then, I made my way around Lake Calhoun (super crowded), Lake Harriett (slightly less crowded, but I met a lovely elderly biker friend and contemplated buying mini-doughnuts and ice cream (I had missed lunchtime)), down the Minnehaha Parkway (where I flipped on my bike and didn't unclip in time. I'm ok; just some bumps and a bruised ego), around Lake Nokomis, past the Minnehaha Falls, across the bridge where Ron and I got engaged, onto Mt. Curve Blvd (more beautiful houses), on Mississippi River Blvd, and finally, back on Summit to head to my car at Mitchell. Phew. That was a long explanation. But, the bike ride was amazing. Despite the fact that my route directions were so small that I couldn't read them. And, despite the fact that I got lost several, several times so that my 36 mile bike ride actually clocked out to 50+ miles. And, despite the fact that I have a wicked sunburn going on (I wore a short sleeve bike jersey, so my sunburn starts mid-arm, stops at my watch, and starts back up again on my hands). And, despite the fact that I flipped my bike and got pretty hurt (I was hungry and didn't bring enough food to fuel so I nearly fainted; thank goodness for caribou coffee multigrain bagels and the $2 I had with me), the bike ride was an amazing success. I can't wait for out-of-towners to visit so I can take them on this ride. It is honestly the best possible way to tour the cities! Fantastic eateries along the way. Beautiful scenery and a ton of fun! I was cruising at a leisurely pace. Anyone could do this bike ride! So, it's odd that with such plentiful sunshine, I was craving a winter-based comfort food. Yep, I wanted soup. I had checked out a recipe for a Black Bean and Sweet Potato Soup a few months ago. And, I've been thinking about it ever since. So, I made it. And, I'm glad I did. Ron wasn't too thrilled about the fact that I made soup, but he ate it, and judging by the "spoon scraping an empty bowl" coming from the other room, I knew he was happy. He said it was delicious and I agreed. It was kind of a mix of fall flavors fused with Mexican. I adapted it slightly from the recipe below. It made a small batch. Next time, I'd probably add more broth to make it more soupy. I used 1 can, but next time, would probably use about 1.5-2. Add more as needed to suit your preference. Heat T olive oil in large soup pot on M-M/H heat. Add 2 cloves garlic and saute until fragrant. Stir in sweet potato and red pepper. Cook for about 5 minutes. Add vegetable broth, water, beans, corn, and tomatoes. Stir. Add spices: chili powder, cumin, red pepper. Stir. Simmer for about 30 minutes or until potatoes are tender. This is, by far, my favorite homemade granola recipe. I've made it several times now and it is just really, really, REALLY good. I always pick up the ingredients at the bulk section in the grocery store. I love the 'heart healthy mix' of walnuts, pecans, almonds, etc. because they have less sodium than the jarred containers. This recipe uses applesauce instead of oil (I lie; there is 1 tbsp of oil, but unless you are eating the entire batch, I don't think it should have too much of an impact) but it does not fall short. I added some flax seeds to the recipe, but these can easily be left out. Also, I HIGHLY recommend added dried apple pieces to the granola. You'll be sorry if you don't! In a large bowl, mix together oats, nuts, sunflower seeds, flax seeds, brown sugar, cinnamon, and salt. Set aside. Bake for 45 – 50 minutes, stirring every 10 minutes, until the granola is a deep brown. Remove from oven and stir in raisins. Cool completely before enjoying. I haven't posted anything lately. I've been making stuff, but not everything has been turning out so well. I think I've finally learned my lesson. Despite how much I love cooking and baking, I simply can't do anything that involves a lot of brain activity around finals. It's pointless. My mind is on other things and it almost always ends up bad. In the past few days, I have burnt a banana bread, burnt chocolate chip cookies and nearly burnt my house down with a pizza disaster gone awry. So, I've decided to keep it to easy things. Despite my simple recipe attempts, this did not stop the asparagus in this meal from smoking up the place! It's my fault, I had the burner on super high. Oops. Ron's been in Seattle for business, so it's just been me at the house. I've been trying to make some healthy dinners, but ones that are individual servings. During finals, I also find that I have a problem with leftovers. A few weeks ago, I ordered the Perfetto Pasta Cooker. I saw it in the Clean Eating magazine and did some research. It came highly recommended, so I did some searching and found one for $10. I ordered it, it arrived, it sat until I decided I finally wanted pasta. Wow, it is pretty damn nifty!! Granted, I probably didn't need to spend $10 on this little tube, but it's pretty damn incredible. I don't have to dirty dishes. I don't have to bring out a separate strainer. I don't have to keep stirring. What I do have to do is boil some water, pour it in the tube, stick in the pasta and let it sit for about 16 minutes (it takes a bit longer than conventional pasta). I left my WW linguine in the cooker for about 17 minutes and it was cooked perfectly! Even better? It comes with this tiny little measuring thing so I could ensure that I was only eating one serving of pasta. I decided to serve this up with some pan fried asparagus and pine nuts. Overall, the meal was really good. The asparagus got burnt, but I actually kind of like that crunchy taste. For Pasta: Cook pasta according to package directions. Drain and set aside. For Asparagus: Heat olive oil, water, garlic and asparagus in saute pan over medium-high heat. Cook for about 2 minutes or until most of the liquid is gone. Stir. Cover with lid and cook for another minute. Remove lid and stir. Cover and repeat until asparagus are crisp tender, about 5 minutes. For Assembly: Place pasta on serving dish. Add asparagus; toss to combine. Sprinkle pine nuts, onion and cheese over dish. Season with salt and pepper.